Sew Useful Designs: Fancy a cuppa? Fancy coming over for a cuppa? 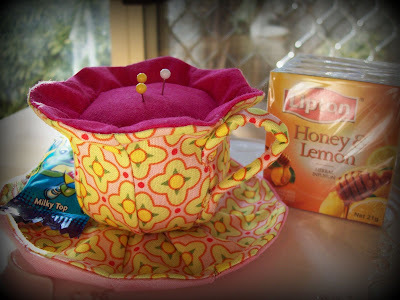 The pincushion was made from a pattern called 'High Tea' by Cynthia Martin of Tasmania. I purchased the pattern from Kirkbride Quilting. As for the little pin topper, I made it from air-dry clay and a polymer clay mould, then painted it with acrylic paints before giving it a satin varnish. When shall I pop that kettle on??? I'm coming for the freddo! Gorgeous cuppa!! 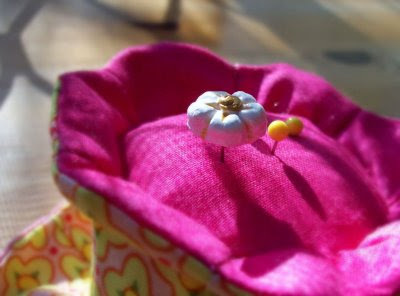 Mai made me a pincushion for the Summer Swap, it's gorgeous! I will be glad to join in having a cuppa. Loved the garden tour. Happy days. I'll be there in a sec ! Wow Vik, it turned out fantastic. It really is such a cute pattern. What a gorgeous cup. Lovely colours and great pin toppers. Put that cyber-jug on girlfriend - I'm on my way!! That is THE cutest pin cushion I've seen!! Have fun stitching while I'm gone, Vikki. I already miss you! I got that cup and I love it, Thank you very very much Vikki. What a wonderful pincushion! I've never seen something like this before! And the pin is very pretty too! I'll be right over for that coffee. 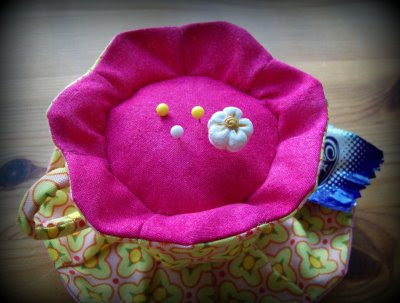 I'll also put in an order for that very cute pin cushion cup and some of those pin toppers. I've never seen or heard of them before-oh where have I been? How absolutely adorable. I think I would like a fruit tea please! 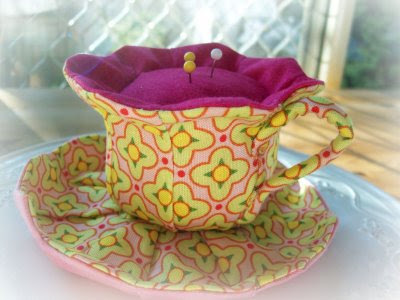 that is the cutest pin cushion ever, pour me a cuppa ta! Love your cuppa & Mai's sheep too! How lucky you both are! CUTE! Love it and all things tea. What a really nice cuppa you have! Love your site, I don't now wich way took me here, but hope to come again in the future. Beautiful gardens & Puff is finished!